In this guide you'll learn how to split a single piano part into separate hands. This may be necessary when working with songs you found elsewhere or created yourself. Most MIDI editors focus on the final output quality of the sound. So the internal grouping of notes is often overlooked, combining the piano into a single part. Following this guide, you'll be able to practice each hand separately. 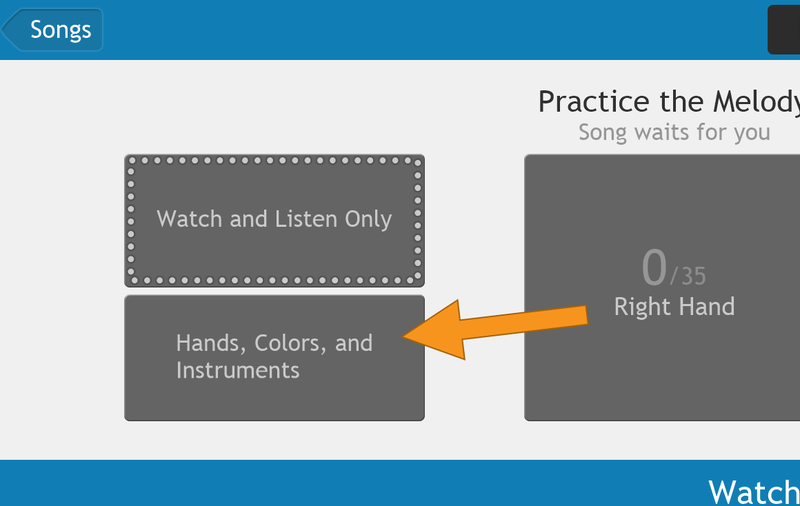 From the song setting screen, click the "Hands, Colors, and Instruments" button. This will show the list of parts contained in the song. Find the part you'd like to split from the list. It will usually be set to Background or Right Hand by default. Select the mode and choose Custom from the list that appears. This will launch the hand assignment tool. Left-drag the mouse up and down. Or use the mouse-wheel. Or tap on the song timeline. Left or right click on a note. Left click will assign your selection from the tool palette on the left. Right click will assign from the tool palette on the right. Right-drag a line with the mouse. One-finger drag. Or tap on the song timeline. Tap on a note. Tapping with one finger will assign your selection from the tool palette on the left. Tap while a second finger is already down will assign from the tool palette on the right. Drag with two fingers to draw a line. These can be changed on the Settings » Shortcuts screen. A good first step is to split the entire song all at once. This will set most notes correctly and only small corrections will remain. Select the Split From Here tool from the menu. Click or tap near the middle of both hands. Adjust the split point until it looks fairly accurate. Use the Arrow ← and Arrow → shortcuts to quickly jump through the song. Choose the Continue button at the lower right to apply the split. Continue to fine-tune the split by drawing shorter lines. Change individual notes using the controls described in the cheat sheet, above. Once you're finished, hit Back in the upper right. Both hands should now show in the box for that part. Optional: Select the Auto Color button from the lower right to unify the hand colors and hide all the background parts. Hit Back in the upper right or press Esc. Now you're ready to practice each hand separately!